Retired turkey biologist Mike Seamster said the angst today among many Tarheel State turkey hunters is caused because "they're scouting before the season starts and hearing gobblers, so that's when they want the season to open." As it is now scheduled, the beginning of turkey season often corresponds to a "lull" period of gobbling, which honks off some hunters. "With the season set to start the second Saturday in April, that could be from April 8 to April 14" Seamster said. "Turkeys might be gobbling or hens could be already nesting, then you've got a lull (when the season opens)." Although many hunters don't understand why turkey seasons aren't open earlier when gobblers are sounding off, Seamster said the reason is strictly biology. The concept of a spring season is to allow hunting only after the first round of mating has occurred. "If you had, for instance, a county without many hens and allowed earlier hunting, a lot of the gobblers might be killed, and a large number of hens wouldn't be bred," Seamster said. "Then the result is a poor hatch, two or three springs in a row maybe, and the problem multiplies. "When you have a maximum population in a state, like Georgia for instance, you could afford to shoot some (gobblers) early, but biologically, it's not the thing to do I in most states." 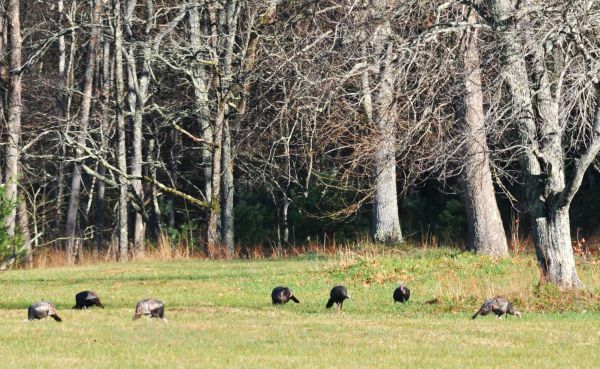 He pointed out that North Carolina's first turkey biologist, Wayne Bailey, recommended opening the season the third Saturday in April, and that was so for many years. "For political reasons, mostly from (eastern North Carolina hunters), the Commission moved the season opener down there to the second Saturday, so we had a split season," Seamster said. "Then the western people didn't like that, so the Commission made the season open on the same day statewide: the second Saturday in April."